To add text to a document in Publisher, you will have to draw a text box. The text inside this box can be formatted just like any other text in a Microsoft Office program, and you can also format the box itself. This process also works in Publisher 2013. Step 1:In your Publisher document, select the Home tab. Click Draw Text Box in the Objects group. With your mouse, point to where the text box is to appear, hold down the mouse button and drag to create the size and placement of the text box. Release your mouse button to complete the text box. A cursor appears in the text box, indicating that you can type inside the box. Note that the Format tab under Text Box Tools is selected. Here, you can format the text that you add to the text box. 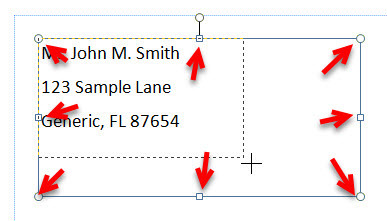 Step 7:To resize the text box, click inside the box, then point to one of the circular or square selection handles and drag the the handle inward or outward to the desired size. 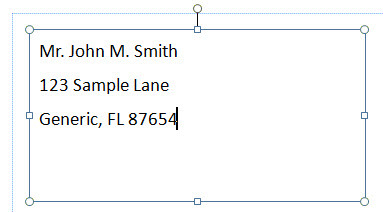 Step 8:To format the text box, click in the box, then click the Format tab under Drawing Tools. Here, you can add a border and effects to the text box.